Here’s a stupid fact about college basketball: The million-dollar sponsorship deals that schools sign with various apparel companies has created a sport in which there is no universal game ball. Nike schools use Nike balls, Adidas schools use Adidas balls, and so on. “It’s definitely different,” Hayes said. “Personally, we don’t like it too much. I don’t like the Under Armour ball whatsoever. But that’s the way this amateur sports league is set up. We’re supposed to be having fun, but all the money is in these basketballs that colleges play with. But it’s an amateur sport, we’re just here for fun. It’s not really that serious. So I guess any ball should be OK. 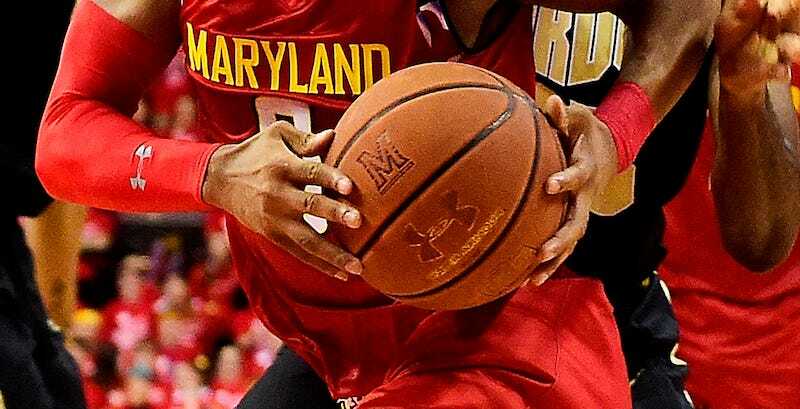 It may seem like Hayes and the others are picking nits, but it’s undeniably silly for players to have to spend three days adjusting to a new ball just because Maryland is in bed with a billion-dollar apparel company. The NCAA should just use one universal ball, and the fact that it won’t tells you quite a bit about its priorities.